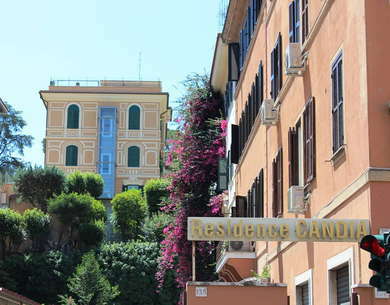 Located in the Prati area just behind the Vatican Museums, this place, offering both hotel-style studio and 2- and 3-bedroom apartments with kitchenettes, is the perfect solution for those looking to stay just outside the chaotic centro storico but close enough to major sights. In particular, travelers seeking something a bit more low-key will feel right at home here. The residence is also conveniently close to two Metro stops, and one of the best farmers' markets in all of Rome, the Mercato Trionfale. YOU SHOULD KNOW WiFi is only available in public areas. Rooms are quite spacious, but decor is a bit outdated in dull brown or yellow colors. Mattresses and pillows cold use a refresh. There's plenty of closet and storage space, and giant mirrors give the rooms a wide-open feel. Some of the rooms are quite dark, so check ahead if you want a room with a view. TV unfortunately has Italian channels only. Apartments have a fully-stocked kitchen which makes staying in Rome on a budget easy to do. The penthouses have a perfect view to St. Peter's Dome. Bathrooms are quite clean with bright tiles. There's little little counter space and you'll need to bring your own toiletries. Showers are a good size, even for tall folk. YOU SHOULD KNOW Towels and lines are only changed weekly. There's not much to the lobby except a check-in desk near the front entrance. The staff is however extremely knowledgeable and always ready to help with any trip-planning needs. If you plan on spending the majority of your time at the Vatican, this is the perfect location. Taxis, trams and buses are everywhere to reach the rest of the city. And the Candia is just a 7-minute walk to the Ottaviano Metro stop for easy transport, and it goes directly to Termini Station. At Bonci Pizzarium (5-minute walk) the chef pays special attention to how the dough rises, making this pizza standout in a city full of pies. If you’re looking for a vegan meal head to Orto (23-minute walk), which recreates popular Roman dishes with healthier ingredients. Saxophone Pub (8-minute walk) is an authentic hidden pub with a wonderful staff and great drinks. Passaguai (14-minute walk) is a rustic friendly wine bar where you can rest your feet after hitting the Vatican Museums all day. The Residence Candia is a great option if you're on a budget and looking for a self-service option. There's also free parking if you're coming by car or want to rent a scooter. While furnishings are a bit outdated, they're kept very clean. And the kitchenettes are convenient to cook your own food. It's a great location with lots of grocery stores nearby, and the Vatican just steps away. And hotel staff is always on hand to help with any of your needs.